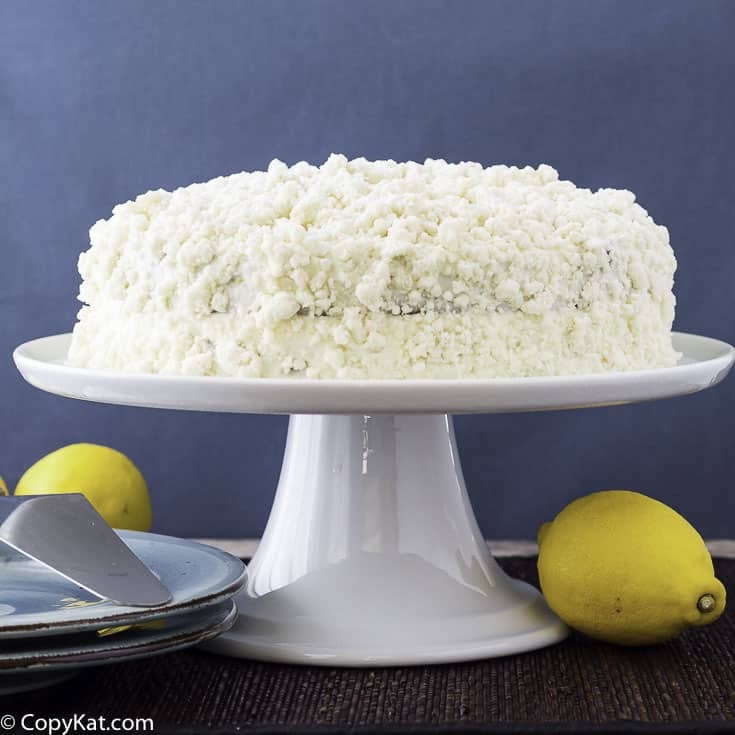 Make your own Olive Garden Lemon Cream Cake at home! The Olive Garden Lemon Cream Cake is a recipe I felt has been missing from my blog for a long time. 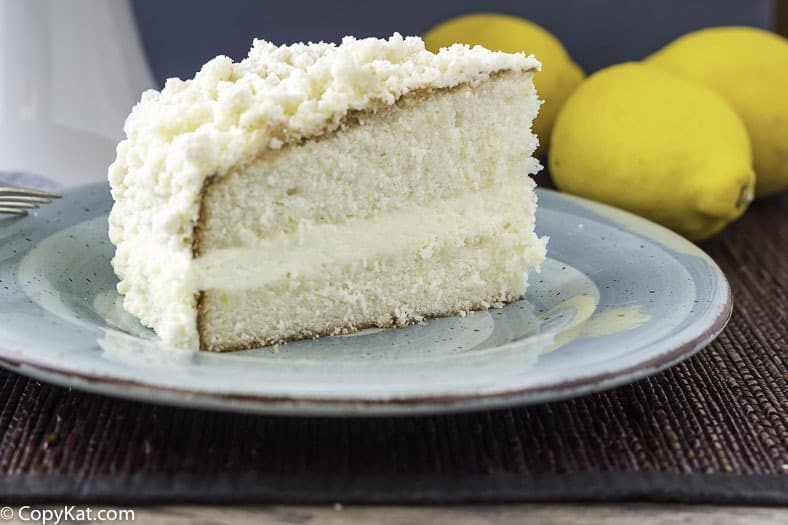 We all love the Olive Garden recipes, but I haven’t had their luscious lemon cream cake … until now. If you are like me, you love the Olive Garden, they are to resist. I never felt like I had enough of their dessert recipes. I have their tiramisu, but I always felt like I needed more of their recipes. I love this cake, it is a layer cake with a creamy filling that you can’t miss. While these cakes make look difficult to make, I promise, you can recreate this fancy dessert cake with this recipe. The cake if finely-textured with a lemony mascarpone cream and topped with an abundance of buttery crumbs. You may substitute full fat cream cheese for mascarpone, or even use half of each. I do not recommend a low-fat cream cheese, as the full fat version is needed for the structure of the cake. You could double the filling if you desired to have an over the top super impressive layer of lemon cream in the middle. 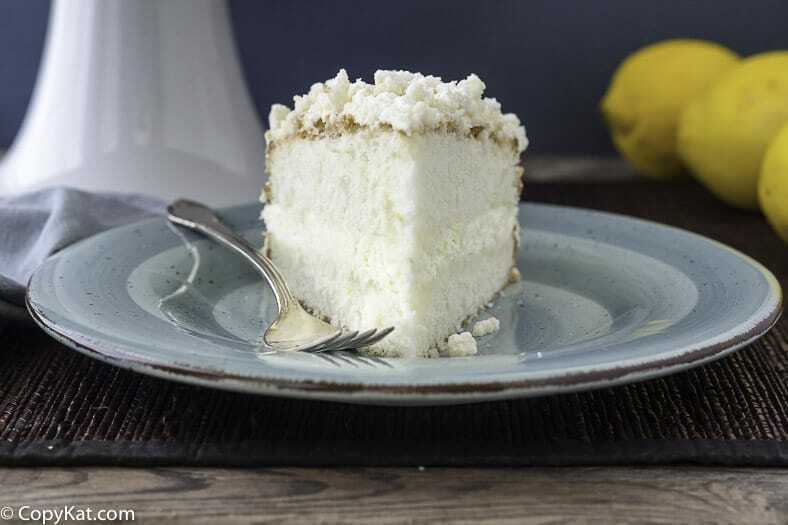 This finely-textured white cake is layered with lemony mascarpone cream and topped with an abundance of buttery crumbs. Feel free to substitute full fat cream cheese for the mascarpone or even use half of each. You can also double the filling if you’d like a super impressive layer of lemon cream in the middle! You could even add limoncello to the mixture for some extra decadence. Please note, please use a 9-inch springform pan for this cake. Please do not substitute another size pan. While you could use two cake pans, it is easier to do this in a spring form pan, as it will give some structure to the filling while it is setting up. You can save so much money when you make one of these cakes. Cake Directions Grease a 9” springform pan and place on a cookie sheet. Place a rack in the bottom third of your oven, and preheat to 325F. Whisk together the milk, egg whites and extracts. Set aside convenient to your mixer. In the bowl of your stand mixer fitted with the paddle attachment, add sugar, self-rising flour and salt. Beat briefly to combine evenly. Add the softened butter and about ¼ of the milk/egg white mixture. Starting on low speed, mix until combined, about 1 minute. Scrape the bowl. Increase the speed to medium and beat for 2 minutes to mix in some air and lighten the texture. Add the remaining wet ingredients and the zest and beat for about 30 seconds to blend in the liquid. Scrape bowl and beat a few more seconds. Scrape batter into prepared pan and bake until well-risen, domed and golden brown, about 45 minutes. Check after 30 minutes and gently rotate the pan to ensure even baking. Tent foil over the pan if necessary to prevent over-browning. Cake is done when it is just starting to pull away from the sides of the pan and the top springs back when pressed lightly. Remove to a rack to cool for about 20 minutes. Run a thin knife around the inside of the pan to release the cake and then remove the springform sides. Allow cake to cool completely. For the Lemon Cream Filling Combine all the filling ingredients in the bowl of your stand mixer fitted with the whisk attachment. Whip until the mixture just reaches stiff peaks. Scrape the bowl as necessary and, if using mascarpone, take care to not overwhip or the filling will become grainy. Refrigerate until ready to assemble the cake. For the Crumbs Combine all the crumb ingredients in a medium bowl. Using your hands, mix/crumble together until there is no loose flour and none of the crumbs is larger than about the size of a chickpea. Refrigerate until ready to assemble the cake. To Assemble and Garnish Carefully slice the cake in half horizontally with a long serrated knife or with a cake leveler. Place the domed half on a plate. Keep the bottom half on the base of the springform pan and reattach the sides. (Optional) Brush half the limoncello evenly on the bottom layer of cake. Reserve 1 ¼ cups lemon cream filling and spread the remaining filling in a generous layer on top of the bottom layer. (Optional) Brush/drizzle the remaining limoncello on top of the filling so it will soak into the top layer. Place the top layer of cake on top of the filling, and press down gently. Refrigerate for about an hour to chill the filling. Remove the springform sides from the pan. Spread the reserved frosting in a very thin layer around the sides and on top of the cake. Don’t worry if a little cake shows through—it really will be a very thin layer of icing which will act as glue for the crumbs. Holding the cake at an angle over a tray with one hand, gather up a small handful of crumbs and press them into the side of the cake, letting the excess fall into the tray. Rotate the cake a little and press more crumbs into the side. Continue until you’ve covered all the sides with crumbs. Pour the remaining crumbs evenly on top of the cake. This will be a very generous layer. If you have any thin spots, fill in with any crumbs that fell onto the tray. Press the top crumbs into place and refrigerate until 30 minutes before serving. To Garnish and Serve Right before serving, use a fine-mesh sieve to sift powdered sugar evenly over the top of the crumbs. To make clean cuts, use a long sharp knife with a thin blade and wipe the blade clean between cuts. Store any leftover cake, covered, in the refrigerator. I am going to make this cake. Can you make just the cake part ahead of time and freeze it, then finish it when needed? I have to be honest, I haven’t tried doing this. I can’t say for certain. I’m not a desert maker much, but really want to try your recipe. Could you clear up something. For the lemon creme filling what INGREDIENTS does the Monticello replace exactly? Also, do you feel using creme cheese versus mascarpone makes a difference to the recipe, and which one would you recommend? Thank you for your recipes, love them! I’m sorry, what does the limoncello (auto correct on me in my prior question) replace in the filling, when you say optional syrup, what INGREDIENTS does this replace? The syrup is an OPTIONAL step. You don’t need to do it, you may omit all steps when it refers to the syrup/lemoncello. It is an optional enhancement. The recipe should be made with the mascarpone cheese, the flavor is better. Mascarpone can be hard to find in some grocery stores. I made this cake yesterday for my brothers birthday and it was AMAZINGLY! I didn’t have lemon so I used orange instead. . I made a special dinner for my brother and his favorite part of the meal was the cake. Thanks for developing the recipe and sharing it with us. I spread a thin layer of cream filling on the top and side of cake. I use a box of lemon cake mix and cut in the butter like you would with crumb topping on a french apple pie. Then I cover the top and side of cake with lemon crumb topping. Not need to add sugar. The cake mix is sweet and tart. Big hit with my family. Hint: Use equal amounts of mascarpone cheese, (not cream cheese) powered sugar and whipcream, lemon zest and lemon juice for cake filling. I tried this recipe but to no avail. I had to bake it at least an extra half an hour because the center was gooey. I did put tin foil over the top to keep the edges from burning and eventually, the center cooked. Unfortunately, when I took the sides of the springform pan off, it didn’t rise at all! I was so disappointed! I was wondering what I did wrong- it almost seems like it’s missing an ingredient, like baking powder. I did use the self-rising flour. I’m so sad because it seemed really promising! It sounds like the leavening agent did not work. Could it be possible that the self-rising flour was old? Sometimes food can be old or not properly rotated on the grocery store shelf, and you could be purchasing older product unknowingly. I am really sad the recipe wasn’t a success for you. Drive to Olive Garden and buy a piece at $7.50 each? No thanks, I read food blogs because I like baking, so I am trying this one! My filling came out too thin? Any suggestions on how to thicken it or should I just abort and try again? This recipe is amazing. However, I seem to have messed up somewhere with my filling, and now I have a delicious bowl of lemon pudding in my fridge. Any ideas on how I may salvage this and thicken it up, or should I just abort and start over? Hello Stephanie—First of all I love that you so detailed in your instructions–secondly I love the fact that you share this recipe using a from scratch cake recipe and not a box—boxes are fine but I just prefer from scratch and lastly I wanted to ask you a question regarding the crumb topping. Is the topping baked at all or how exactly does that work to combine the raw flour and sugar and butter. I imagine crumb topping to be buttery and crumbly with a mild crunch. I have had many of their desserts but have not tried this one so I am not familiar with the cake but have heard its delicious. I was thinking maybe a thin layer of lemon curd with the filling might be good as well. Let me know that you think. The flour is raw. You can pasteurize it yourself by cooking it for about 10 minutes at 350 degrees, the crumb topping is not crunchy, it looks like it could be, but it isn’t. If you are concerned about the topping, you could omit this part of the recipe. Agreed that the comment from Patricia was gratuitous/unnecessary, just skip the site if you don’t want to spend much money or time on food. Not everyone wants the cheapest, no frills recipe all the time. Eg, I cook all kinds of ways and think this recipe looks terrific. Also, just wanted to confirm that the required butter amount is 6 oz? Was confused by “6 ounces sticks unsalted butter, softened”. Thanks. I am so making this delicious looking cake! I am nowhere near an Olive Garden, and I have never tried their cake, but I do love a good lemon cake! I’m just confused on the amount of butter, what is the cup measure for the butter? Wow! I’m more than excited to try this recipie! You know that dessert, the one you’re always telling everyone they HAVE to try? This is it for me & I don’t have to drag everyone to OG (which is not bad, but limited for my taste) & force them to order this. I can just present it at my next dinner party and then, yum! they will finally understand. Thank you, Stephanie, for wonderfully detailed instructions on how to make one of my very favorite restaurant cakes. Plus, it’s guaranteed to be fresh! This sounds luscious and I will keep it in mind for the next time I need to take a cake somewhere! I’ve never had Olive Garden’s cake. Stephanie, I have come here many times to get some of your recipes from my favorite places. I am very appreciative of these, and they are free!! It is beyond me that someone would take the time to criticize someone that has put in so much time as a service to others. Please continue to send these out, I know there are a lot of others like me that love to try these and appreciate what you do.!!! Thank you !! I cannot believe that any reader in their right mind would make this copycat recipe for the Olive Garden Cream Cake. The list of ingredients alone would put me off. The cost would be prohibitive and the instructions go on and on and on. It would be less expensive to get in the car and drive to an Olive Garden and just buy the cake from them. Copy cat is a cute idea; but highly impractical in this case. Thank you for taking the time out to read the recipe. I know I taxed your time with a detailed recipe with lots of instructions. I am sorry you didn’t enjoy this recipe was too detailed and had lots of steps. I couldn’t make this recipe easy or quick. Not all recipes can be made by throwing together a cake mix and a can of frosting. Again, I am sorry this recipe wasn’t something you had wanted. Patricia… as Stephanie says, not everything is a throw together cake mix style. Sure, there are lots of steps etc. but, as an ad here in New Zealand goes… good things take time. Also, it may, or may not, come as a surprise to you that not everybody in America (obviously I am not but that’s beside the point) lives within easy driving distance to an Olive Garden. Apparently u do not enjoy cooking . No reason to be so rude. Go on ,buy all ready made food,but very rude to make the comments u made .